My 9 year old daughter loves original costumes. She thinks all year about her costumes. She decided on Alfalfa from The Little Rascals. 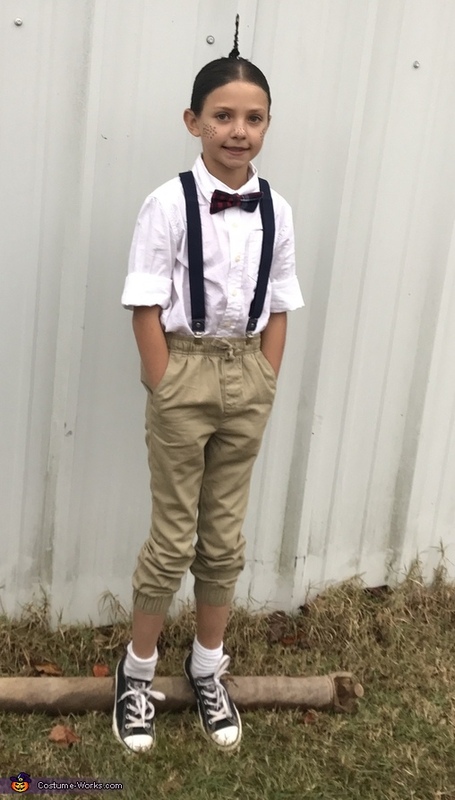 We went to target and bought all clothes from the little boy section, including the bow tie and suspenders. We also bought the black spray hair color and hair glue at Walmart. She already had the socks and black converse! I parted her hair, left out a small piece for the cowlick and put the rest of the hair in a bun. Used hair glue from Walmart on the cowlick. I had to fold her long hair in half and dry it. I sprayed it black. My sister used eyeliner on her bull dog, Lucy. She made a great Petey!